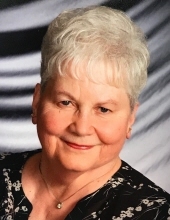 Joanne Albers, 79, of De Pere, passed away peacefully surrounded by her loving family on Friday March 22, 2019 at a local hospital. The daughter of the late Joseph and Eleanor (De Ruyter) Malewiski was born November 28, 1939 in De Pere. She was a graduate of West De Pere High School, Class of 1957. On July 11, 1959, she married Bill Albers at St. Boniface Catholic Church. Joanne was a loving mother, grandmother and valued homemaker. In her early years she also helped Bill with the family business. Joanne was a woman of strong faith and had always been an active member of her church including serving as past president of the St. Boniface Christian Mothers and volunteering through OLOL. Additionally, she volunteered as a poll worker, worked as a referee for local women’s athletic events and many other local charities. She was always there to lend a helping hand. Joanne was also an avid follower of her children and grandchildren’s athletic and school events, a season ticket holder for UWGB women’s basketball and frequented the SNC women’s basketball games. She will be missed by her Monday card group, monthly card group with high school friends and bowling league teammates. Survivors include her husband, Bill, their children, David and Penny Albers, Katherine and Brad Hunt, Karen and Scott Slusar, Daniel and Nancy Albers, and Kristine and Dean Talbot; nine grandchildren, Gabrielle Albers, Joseph Albers, Christian Albers, Ashlee (Tyler) Bartlow, Austin and Dylan Hunt, Allison Slusar, Calvin and Patrick Albers. In addition, she is also survived by Bill’s family, Mike and Mary Ann Albers, Mary Racine, and Marge and Erv Hutjens. She was preceded in death by her parents, a brother, Stanley a sister, Josephine, and her in-laws, Ed and Margaret Albers and John Racine. Friends may call at Ryan Funeral Home, 305 North Tenth Street, De Pere from 4:00 to 7:00 pm on Friday March 29, 2019. Visitation will continue on Saturday from 9:00 to 10:15 am at Our Lady of Lourdes Catholic Church, De Pere. Mass of Christian Burial will be celebrated at 10:30 am on Saturday with Fr. Benny Jacobs, O. Praem., and Deacon Mike VanderBloomen, officiating. Burial in Mt. Calvary Cemetery. A memorial fund has been established for Our Lady of Lourdes Catholic Church and the Albers family charities. The family would like to extend special thanks to the De Pere Fire Rescue, as well as the E.R. and I.C.U. staffs at Bellin Hospital. To send flowers or a remembrance gift to the family of Joanne M. Albers, please visit our Tribute Store. "Email Address" would like to share the life celebration of Joanne M. Albers. Click on the "link" to go to share a favorite memory or leave a condolence message for the family.